I’ve been working hard to not let our crazy after school schedule get in the way of healthy dinners. I’m on the look out for stuff I can prepare quickly earlier in the day and then pop in the oven for a fast and awesome meal when we get home. My kids have recently fallen in love with fish so this foil-baked rainbow trout, basically the perfect easy fish recipe, is our new favorite quick healthy dinner. Preheat oven to 450 degrees. Cut 4 sheets of heavy-duty aluminum foil, into squares a few inches longer than your fish. Oil the dull side of the foil with olive oil. Place a piece of trout, skin side down, on each square. Sprinkle with salt and pepper. In a bowl combine tomato, garlic, 1 teaspoon olive oil and salt and pepper. Spoon over the middle of each trout fillet. Place a sprig of thyme on top (or sprinkle if using dry.) Drizzle 1/2 teaspoon olive oil over each. Fold the sides of the foil up and together and then crimp the ends over to make a packet. Place the packets on a baking sheet and bake for 10-15 minutes, testing after 10. The fish is cooked when it’s opaque and flakes when pulled apart with a fork. You can plate the entire packet and let everyone open their dinner at the table but be careful not to let anyone get burned by the steam. 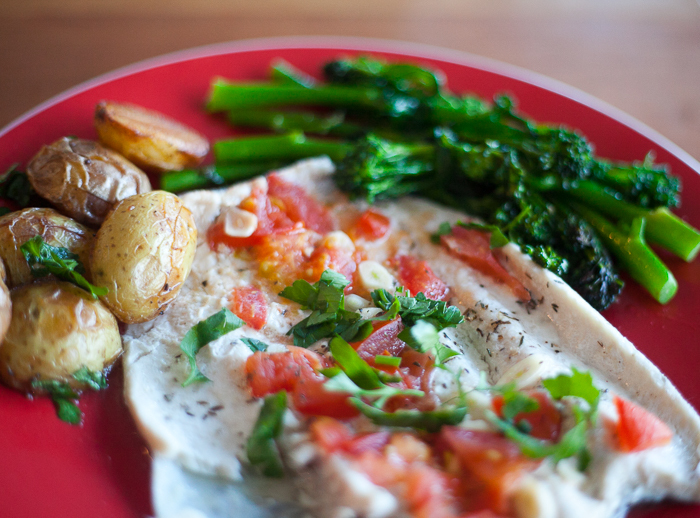 We served this up with some oven roasted potatoes and lightly stir-fried broccolini. So satisfying!